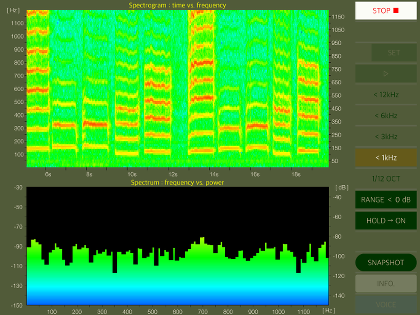 "Onmon" is Spectrogram Analyzer app for Audio and Voice band. It uses the Fast Fourier Transform (FFT) processing to analyze incoming sound signals and provides a precision frequency response measurement. "Onmon" is a visual representation of the spectrogram of frequencies in a sound as they vary with time in the frequency range of 24kHz from 20Hz. 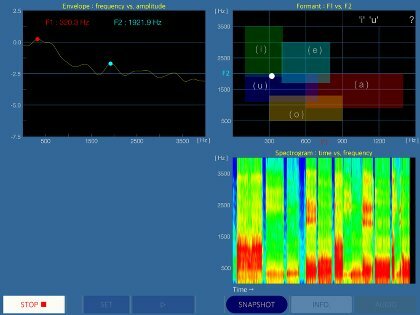 In addition, this app is equipped with the replay function, so you can see the spectral analysis results offline. By Ver 5.0, it has added the time resolution settings function and changed the UI design. This app has two analysis modes, Audio mode and Voice mode. 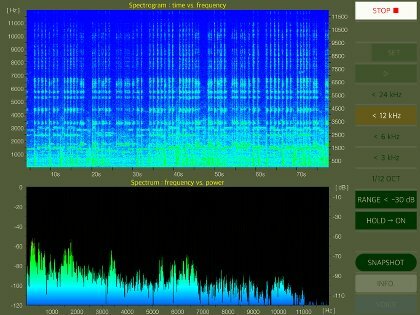 Audio mode performs a real-time spectral analysis as the target of audio signal by Spectrogram and Spectrum. It can be used for discovering visual hidden images in the various sounds, such as music, birdsongs and environmental sounds. You can also be used to capture an unpleasant high-frequency noise in your sound system. 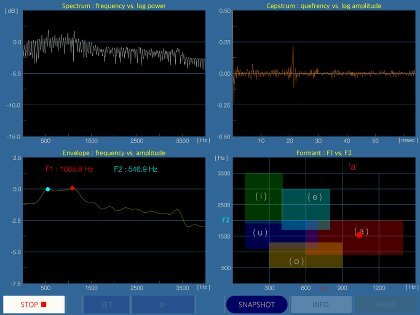 Voice mode performs the frequency domain analysis as the target of voice signal, which can be displayed simultaneously Spectrum, Cepstrum, Envelope, Formant and Spectrogram. It can be used for visualization analysis of voices, speech, vocal, and squeaking sound of the animal. Please to click the following link to download "Onmon" from App StoreTM. It will be open the download page on App StoreTM. Recommendation : Compatible with iPad. Requires iOS 11.4 or later. The spectrogram is a graphical image with two geometric dimensions that the horizontal axis represents time and the vertical axis is frequency, and the addtional third dimension is indicating the amplitude of a particular frequency at a particular time that is represented by colour of each point in the image. "Onmon" measures the input acoustic signals, and displays the frequency spectrogram of 24kHz, 12kHz, 6kHz, 3kHz and 122 split bands of 1/12 octave. Sampling Rate: 48kHz/sample (maximum measurements frequency: 24kHz). Display capture facility (Snapshot: Storage image file in PNG format). "Onmon" has two operation modes, Audio and Voice mode. It can be switched between Audio mode and Voice mode. Mode switch is located on each mode, the operation mode transitions by tapping the button. The system will start Audio mode in the app startup. The top view of Audio mode includes the operation control buttons and the measurement display (TRACE DISPLAY). It has thirteen buttons for the operation control. In order from the top, there are the measurement control (Start/Stop), frequency selections (1kHz - 24KHz, 1/12 octave band), replay control(Set/Play), hold function (hold), signal power range (range: 0/ -30dB), Snapshot, INFO and mode switch (Voice). "TRACE DISPLAY" is the image monitor that displays the frequency spectrogram and spectum measurements. By tapping "Strat" button, the spectrum analysis will start and display the results on "TRACE DISPLAY". By tapping "Stop", it will be stopped. Measurements of this mode will automatically stop at a maximum of 3 minutes. In addition, the microphone input signal is temporarily stored as digital data. You can re-display the analysis result in Replay function. According to the sound characteristics and the observation bandwith frequency, you will be able to select the target frequency. You can choose one of the frequency from five frequency selection button (24Khz, 12kHz, 6kHz, 3kHz, 1/12 octave band). For example, if you select the 6kHz frequency, the spectral measurement will be displayed the frequency range up to 6kHz. In the case of 1/12 octave, it will be displayed at 122 divided frequency bands of 1/12 octave. This function is used to observe changes in the time axis in more detail. In Version 5.0, the time resolution selection function (L/H) has been added. When the time resolution settings is set to "H", the time resolution becomes higher, and conversely the displayable frequency range is halved. You can change the time resolution setting in the INFO view. The default is "L", which is same as the time resolution up to the previous version. "Hold" is a setting of the peak hold function of the trace display. It is the function to continue to retain the maximum value of each frequency band. If you enable "Hold" (HOLD ON), it is possible to observe a maximum cumulative value of the spectrum of the acoustic signal over a long period of time. The default is to disabled (HOLD OFF). "Range" is the setting of the display power range. Dynamic range of the signal intensity in "TRACE DISPLAY" is 120dB. By "Range" setting, you can be observed in the amplitude display range that is shifted at "0dB" or "-30dB". The default is set to "0dB". It is replay function that can display the temporarily stored measurement data. Load the recorded data with "Set" button and display the measurement result with "Play" button. When it is displayed up to the end point of the recorded data, it is necessary to set the recording data again. You can also evaluate again by changing parameters of frequency, time resolution, signal range. It is displayed the product information, support link and time resolution settings (L/H). If you tap "Support", it will jump to the support page Safari is launched. The view of Voice mode includes the operation control buttons, TRACE DISPLAY. Operation controls has six buttons, in order from the bottom left, the measurement control (Start/Stop), replay control (Set/Play), Snapshot, INFO and mode switch (Audio). This mode performs the frequency domain voice analysis for the microphone input signal. To view Spectrogram chart, please swipe down "TRACE DISPLAY". FFT Spectrum : Display FFT-spectrum of input signal. Envelope : Display envelope of spectrum. Formant : Display Formant matrix of F1 and F2. Spectrogram : Display spectrogram of Envelope. By tapping Strat button, the voice analysis will start and display the results on "TRACE DISPLAY". By tapping "Stop", it will be stopped. Measurements of this mode will automatically stop at a maximum of about 45 seconds. It is replay function that can display the temporarily stored measurement data. Load the recorded data with "Set" button and display the measurement result with "Play" button. When it is displayed up to the end point of the recorded data, it is necessary to set the recording data again. It is displayed the product information and support link. If you tap "Support", it will jump to the support page Safari is launched. "Snapshot" is a function of capturing a still image for the trace image being currently measured. At the tap of "Snapshot" button, the image of "TRACE DISPLAY" is saved PNG file format to Photos. File name is IMG_xxxx.png. In addition, at the first time, the confirmation of access to Photos is required once from iOS system when you press "Snapshot" button. In Voice mode, when you tap or scroll to the screen during measurement analysis, the measurement display temporarily stops. At this time, spectrogram display may be affected, but it is possible to display the measurement result correctly by re-displaying with replay. It is recommended to start measurement after setting to the display screen you want to display in advance. Onmon version 5.0 was released on July 31, 2018. Onmon version 4.1 was released on July 29, 2016. Onmon version 4.0 was released on July 16, 2016. * This app has been renamed to "Onmon" from "fo-Onman". fo-Onmon version 3.0 was released on April 25, 2015.
fo-Onmon version 2.0 was released on August 22, 2014.
fo-Onmon version 1.0 was released on December 19, 2013.